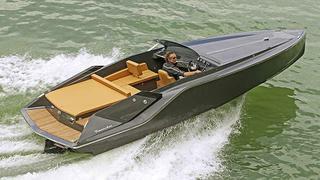 Part Stealth fighter, part Batmobile but all boat, the 747 Mirage is the latest design from the masters of dayboating cool, Austria's Frauscher Boats. With the largest 430hp Volvo Penta diesel installed, this 7.47m fire-breather will touch 56 knots, the kind of speed that makes your eyes stream and face flap. Designed by the KISKA studio alongside hydrodynamic expert Harry Miesbauer, the Mirage features a sharp entry and extra spray rails, combining to force the nose down and produce the kind of turns that only sportscars should be able to make. While a new boat, the 747 Mirage is still very recognisably a Frauscher. Classic design features like the zig-zag rubbing strake and unbordered, single-piece windscreen are carried over, while new ones are integrated like the two huge air intakes down each side. On board, there's plenty of space to stretch out on the rear sunpad, and in the cockpit the backrest of the navigator's seat can be folded down to create a chaise longue. A bimini will offer shade at anchor, while a fridge and Bluetooth-equipped audio system will provide the fun. With three MerCruiser petrol options and diesels ranging from 232hp to 430hp, the 747 Mirage will be no slouch whatever you choose. The €117,900 (exc VAT) boat will make its debut at the Cannes Yachting Festival in September, with the first deliveries expected in early 2015.